Here in Raleigh, protesting is an important part of everyday life. As North Carolina’s capital, most statewide organizations have their headquarters here, and even ones that do not will likely want to host events on Jones Street in front of the legislature or on Blount Street in front of the governor’s mansion. There are labor groups, immigration and voting rights groups, organizations on both sides of the gun regulation debate, and so much more. With demonstrations and protests throughout the year, how can you get passers-by and state leaders to take another look so they’ll absorb your message. Having the right permitting, date, location, and message are key, but so is having professional signs, and Jack Rabbit Signs can make that happen. Color contrasts: No matter how good your handwriting is, if you are writing on a white background using a light color like yellow, your message becomes virtually invisible. The same problem arises with dark lettering on a dark background, for example black on a blue background. Size and thickness of letters: If letters are too small, they can’t be read at a distance. If they are too big, you won’t be able to fit your whole message on the sign. If the letters are too thin, it may not even matter what size they are because they won’t be visible. The solution: have a professional sign maker design them for you rather than trusting an army of people with markers to do their best. Images and design features: Having a legible message makes a good sign. Having logos, artistic representations, and other graphics makes a great sign. Our design team can masterfully create and fit these features onto the sign so it adds impact without crowding out the message. Unity of messaging: Another danger of handing out markers and poster board to a crowd is there may be just a little bit of confusion about the message. Or maybe there will be some less-than-appropriate language used to express the message, detracting from the successful PR impact on those observing. 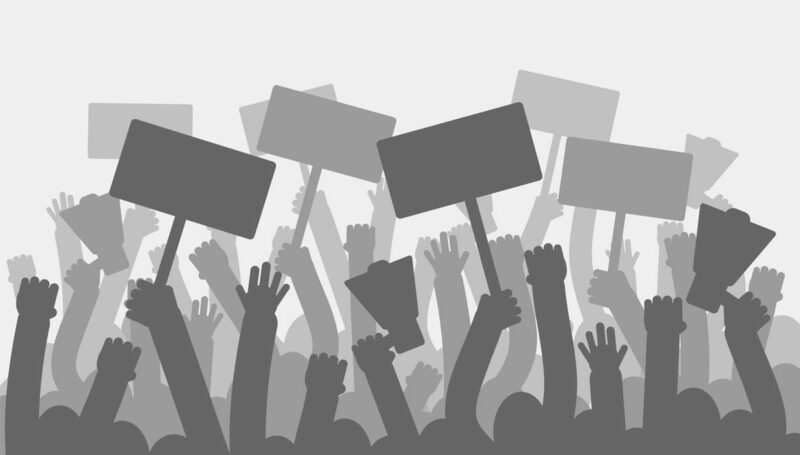 Large banners: There are more reasons to bring signs to a demonstration than just to be held during the event. Larger signs and banners can be useful for welcoming supporters, giving directions, or even just reiterating the message so it’s front and center. If your organization has an important event, maximize its effectiveness with some professional signage. Jack Rabbit Signs has a design team that can help craft the right sign for your event and then we will print the amount required for you to blanket the area with your message. Call us today at (919) 571-1185 or visit us at our location on Glenwood Avenue in Raleigh near Crabtree Valley Mall.